School tours are designed to engage students in critical thinking about art, and to support students to develop visual literacy skills. 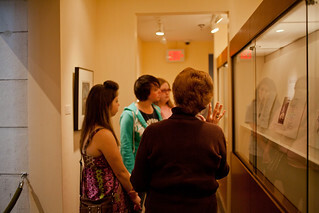 Students of all ages are invited to explore the rich collection of the Brooks Museum on a tour. School tours are sponsored by Kemmons Wilson Family Foundation. For additional information, please contact the Education Department by email or at 901.544.6215. Trained docents will lead student groups on a focused tour of the museum collection or special exhibition. Teachers can select the tour which best meets the needs of their students. Tours for all grades (pre-K-12) can be scheduled with an optional hands-on studio art activity. We recommend Guided Tours as the best way for student groups to experience the museum. All students who visit the Brooks Museum with their class will receive a family pass to return to the museum for a free visit. One adult per every 10 students is required. To schedule a Guided Tour, your group must include a minimum of 10 students. To schedule a studio art activity following your Guided Tour, your group must include a minimum of 20 students. Self-guided tours are led by classroom teachers, home school parents, or community leaders. You may schedule a self-guided tour if you do not wish to have a docent guide your tour, if guided tours are not available on the day you plan to visit, or if your students will be carrying out an assignment in the galleries. Self-guided tours are available year-round. Maximum 40 students. 1 adult per every 6 students required. The Tennessee Arts Commission generously offers arts grants through the Student Ticket Subsidy Program that can be used to cover the cost of bus transportation when visiting the museum for a guided school tour. Applications must be received no less than 30 days prior to the date of your tour. Payments are made directly to your school from the Tennessee Arts Commission. For more information and application guidelines, please click here. Take exit 1B for US-51/Danny Thomas Boulevard. Continue on Alabama Avenue. Exit ramp left at Alabama Avenue. Turn left on Poplar Avenue. Inside of the park continue straight ahead, and you will soon see the museum on the right. Take I-40 West from Nashville to Memphis. Follow the signs. Do not leave the expressway route, although you will see alternate directions for I-40. You will stay on the same road which will turn into Sam Cooper Boulevard, passing exits for Perkins Road, Graham Road, and Highland Street. Continue on Sam Cooper Boulevard through 2 stoplights until you come to a T-intersection. This is East Parkway, and you will turn left. Go to the next traffic light and turn right. You are now on Poplar Avenue. As you travel West on Poplar Avenue, you will pass the forested area of the park on the right and come upon the golf course area. After you have passed the lighted intersection at Cooper Street, take the first right turn into Overton Park. You will come to a 4-way stop at the golf clubhouse. Continue straight ahead, and you will soon see the museum on the left. Take I-55 North into Memphis. I-55 turns into I-240 at a huge multi-interstate interchange, take I-240 West. Do not exit towards I-55/St. Louis signs. Continue straight North on I-240 to Union Avenue. Take Union Avenue East exit. Continue on Union Avenue for about 3 miles. Take Tucker Street to the left. There is a large buff brick Church of Christ building on this corner. Continue on Tucker Street, crossing Madison and Poplar Avenues. Follow straight into Overton Park. The museum is straight ahead on the right. Parking is available in front of the museum and along the roads within Overton Park. A street-level public parking lot behind the museum and next to the Overton Park golf course is also available. Handicap spaces are located in front of the museum's plaza, near the main entrance. Check into Visitor Services upon arrival. Look with your eyes, not with your hands. The oils from hands can damage works of art. Please help us protect the art by not touching. Listen to your tour guide and stay with your group. Walk, don’t run. Horseplay in the galleries is prohibited. Please no gum, food, or beverages. These items can damage works of art if they are accidentally spilled or dropped. No backpacks or umbrellas are allowed in the galleries. Please leave these things at home or at the welcome desk. Group size: We can accommodate groups of up to 60 students for one visit. If your group is larger than 60, we will be happy to help you arrange multiple visits. For student groups of less than 10, please request a self-guided tour. To schedule a Guided Tour, your group must include a minimum of 10 students. To schedule a studio art activity following your Guided Tour, your group must include a minimum of 20 students. Cost: Groups of 10 or more students, and their chaperones, receive free admission to the museum. Chaperones: To ensure the safety and enjoyment of all of our groups and visitors, we require one chaperone for every 10 students. Please refer to our Chaperone Guidelines. Hours: Guided tours are available Wednesday through Friday, between 10:00 and 2:00. Self-guided tours are available Wednesday through Sunday, during museum hours. Reservations: All guided and self-guided tours must be scheduled in advance, and reservations are required. Guided tours need to be scheduled at least two weeks in advance. Preparation: Visit our Lesson Plans page to find lessons, activities, and vocabulary that will help prepare your children for getting the most out of the museum. Teach your students museum manners before your visit so that they know what to expect. Come back to see us! All students who visit the Brooks Museum with their class will receive a family pass to return to the museum for a free visit. Guided tours for schools and community groups do not include a visit to Inside Art. Teachers and group leaders can schedule time for their students to visit Inside Art following the completion of their guided tour and art-making activity. Groups are asked to limit their time in Inside Art to 30 minutes or less. Self-guided groups in Inside Art must be limited to 30 students or less, and must include 1 chaperone for every 10 students. For groups of more than 30 students, group leaders should divide their students into two smaller groups. One can visit Inside Art while the other visits the galleries using a gallery guide. Gallery guides can be picked up at the Visitor Services Desk in the entry area of the museum.